Acer Switch 3 Review - The Best Cheap Surface Pro Competitor? In my Acer Switch 3 review I’ll tell you everything you should know about this Windows tablet. Including its battery life, performance and keyboard cover. The Acer Switch 3 is a very interesting Windows tablet. While it does offer a very similar design to Microsofts Surface series, it is also a lot cheaper. Its highlights are a 12-inch screen, a keyboard cover and an optional stylus. Inside runs an Intel Apollo Lake chipset which is noticeably faster than the Atom x5 of cheaper Windows tablets. How good is it really? That‘s what you‘ll find out in this Acer Switch 3 review. The design of the Acer Switch 3 is very similar to the one of the Switch Alpha 12 from last year and the Switch 5. As you might expect at this price point, the build quality is not as high end as a Surface Pro. In fact, if you use a bit of force, you are able to bend it just a bit. But still, at this price, the quality is pretty good. On the back is an integrated kickstand. With this one, you can angle the tablet down, which works very nicely. The mechanism is smooth as well. Actually, the built quality of the kickstand is excellent. It‘s made out of metal and feels very stable. Acer is giving us most of the important connectors we need. On the right side are all the ports including a USB type C 3.1 port and a full-size USB 3.0 connector. In case you want to expand the storage a bit, there‘s a microSD card slot as well. We‘re also getting a standard 3.5-millimeter audio jack. You‘re not charging the tablet via the Type C port. Instead, there is a separate plug for the charger. It‘s not bad though because the power plug is relatively small. On the front is a 2-megapixel webcam and on the back is another camera with a resolution of 5 megapixels. If you‘ve guessed the quality is not the best, then you‘re right. Most Android tablets at this price have a much better camera. But well, it‘s fine for Skype. Above the display are two front facing speakers. They are loud enough, but again, they‘re not the best speakers. I thought they are fine for listening to some music or watching YouTube though. Display: Is Full HD Enough? The Acer Switch 3 has a 12.1-inch display with an aspect ratio of 16:10. It‘s an IPS panel with a full HD resolution at 1920 x 1200. Obviously, the Surface Pro and other high-end Windows tablets offer a higher resolution. But I still think that full HD is fine. Actually, the quality is quite good for a Windows tablet in this price range. Colors look nice and the viewing angles are decent too. It‘s definitely bright enough. If you‘re working outside in direct sunlight, you are still able to see a bit. Well, not too much though. Compared with the 2017 iPad the display of the Switch 3 is much darker. By the way, you can use an active pen with the tablet as well. The stylus is called Acer Active Pen and supports 1024 pressure points. I haven‘t tried it so I can‘t say anything else about it. Inside my review unit runs an Intel Pentium N4200 quad-core processor. This is an Apollo Lake chipset with four cores clocked at 1.1GHz. In TurboBoost, they can go up to 2.5GHz. Acer is also offering a version with an Intel N3350. This is a bit weaker dual-core chip. We‘re also getting 4GB of RAM and an internal storage with a capacity of 64GB. That‘s fine if you don‘t need to store a lot of data locally. Otherwise, you‘ll have to connect an external hard drive or use the microSD slot. The Intel N4200 is not as powerful as a Core m3. But it is noticeably more powerful than the Intel Atom x5 Z8350 we see in most cheaper Windows tablets. Competitors with the Atom x5 are the Lenovo MIIX 320 and ASUS Transformer Mini. During my review, I was able to surf the web and work with Microsoft Word without any problems. Actually, for that, the Switch 3 is excellent. I was even able to do some light multitasking without any lagging or stuttering. Even though the Switch 3 is not meant to replace a high-end notebook, I did use Photoshop for editing pictures and Cyberlinks PowerDirector to edit videos. With Photoshop I edited 24-megapixel RAW files out of my camera. That did work surprisingly well. If you‘ve got several documents open or are working with a lot of layers, then Photoshop will slow down though. I also edited a couple of videos with PowerDirector. This app runs on lower end devices as well. But, with the N4200, it works a lot smother compared to an Atom. It took the tablet 8 minutes to render a 16 minute full HD video with activated Intel QuickSync. An Atom tablet is noticeably slower. On the other hand, a Core i5 is noticeably faster as well. Yes, if you‘re getting the Acer Switch 3, then you‘re probably not getting it as a gaming tablet. But you will be able to play more simpler games with this. In fact, I was able to play Modern Combat 5 without any lagging. In my benchmark tests, the tablet performed as you might expect from a device like this. In Geekbench 4 it gets 1510 and 4575 points. Using Cinebench R15, the Switch 3 gets 16.61fps in the OpenGL test. Keyboard Cover: Good Job Acer! If you want to work with the Acer Switch 3, then you‘ll probably need a keyboard cover. This one is included with the tablet. Like most competitors, the keyboard dock resembles the Type Cover from Microsoft quite heavily. But that‘s a good thing. In fact, I really enjoyed using the keyboard cover. Acer did an excellent job here. The keyboard cover has a magnetic bar so you can angle it up a bit. That makes it more comfortable to type. I did type a lot with this keyboard and I could use it as well as the one from my much more expensive notebook. I do have two negative points though. Sadly, the keyboard does not have any background light. If it did, it would have been nearly perfect. It‘s also not that easy to clean. By the way, there is an integrated touchpad as well. It‘s not that big but it‘s alright. I didn‘t have any issues when using it. But, it could be a bit bigger. On the Acer Switch 3 runs standard Windows 10. So you‘ll be able to install apps from the Windows Store but also classic desktop apps. The operating system runs and works exactly like on your Windows notebook or desktop PC. So, I don‘t really have to explain or show much here. In case you‘ve never used a Windows tablet before: There are a couple of touch-specific features build into Windows 10. For example, if you‘re using the device without a keyboard, you can switch into the so called tablet mode. In this mode, it‘s a bit easier to use Windows using your fingers only. Once the tablet mode is activated, the start menu transforms into a start screen. That looks like the one from Windows 8. Another change is that apps are usually opened fullscreen. Using gestures you can open two apps side by side very easily though. There‘s also an onscreen keyboard in case you‘re using it without the keyboard cover. Well, as I said, it‘s standard Windows 10. By the way, compared to Android there is a huge advantage. Updates are delivered directly by Microsoft and not by the manufacturer. So you won‘t have to wait for updates at all. Let‘s take a look at the battery life. This is a major disadvantage of most Windows tablets and the Acer Switch 3 is not different. The battery has a capacity of 4670mAh. In my battery test that lasted for a runtime of 6 hours and 25 minutes. As usual, I‘m always doing the same battery tests. I‘m running an HD video over and over again at 50 percent brightness and activated WiFi. During my everyday use, the tablet didn‘t get the best results either. Like with all of my reviews, I did write down a kind of battery diary. I got a runtime of 8 hours and 40 minutes in total. Out of those, I used the Switch 3 actively for 4 hours. The brightness varied between 50 and 100 percent. Mostly I surfed the web, typed using Word and watched some YouTube. So, is the Acer Switch 3 a good tablet? After I was kind of disappointed by the last Atom x5 tablets I reviewed, I liked this a lot more. In fact, I really enjoyed working with it. The keyboard cover is very good, the build quality is solid at this price point and the display is very usable as well. Obviously, if you plan to use apps like Photoshop all the time, maybe even as part of your job, you might want to look at something more powerful. But it is certainly useable now and then. The performance is very good for office work and some good amount of multitasking as well. The only major disadvantage for me is the battery life. It won’t last you a whole working day. Sadly, that’s the case with most competitors and even with a lot of notebooks. 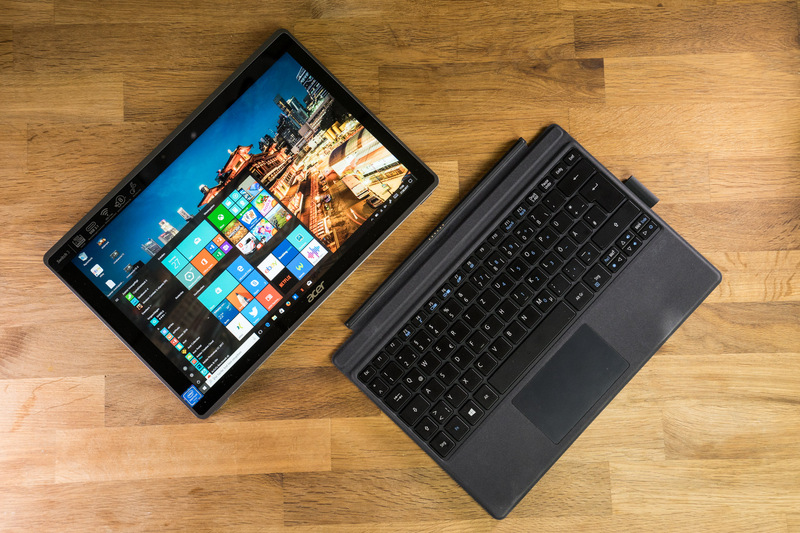 Acer Switch 3 Review:Considering the price, the Acer Switch 3 is a pretty good Windows tablet and a lot cheaper alternative to the Surface Pro. It has a good build quality, a nice display and a excellent keyboard. But, the battery life is too short. Lenovo Tab 4 8 Review – How Good Is This 130$ Tablet Really?